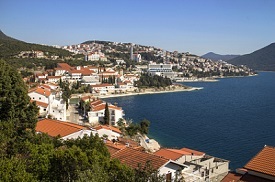 Neum is a resort town located on the Adriatic sea and is the only access point via sea into Bosnia and Herzegovina. Visitors will find that this town offers many warm summer days and a short, mild winter. Perfect conditions for a beachside getaway. Neum is also a great jumping point for travelers looking to go on excursions to nearby destinations such as Dubrovnik and Korcula. Other must-do activities include a tour of the Neum hinterlands, a visit to the vineyard and vintage, and a journey through the olive plantations.